Reid Chitwood is a busy guy — make that very busy — and so he wasn’t too sure about Beat the Odds, a partnership program in which metro Phoenix educational institutions and businesses sponsor schools with high at-risk populations. 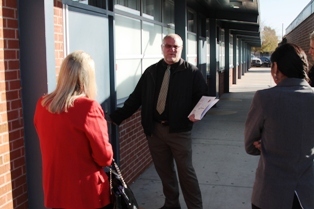 Cortez High School Principal Reid Chitwood toured GCU staff across his campus. Cortez, at Dunlap and 31stavenues, is one of two schools in the Glendale Union High School District being sponsored by GCU this year in Beat the Odds. The other is Washington High. The program provides extra training and resources for principals to tackle the various challenges they face. Chitwood has some challenges at Cortez, where he arrived 26 years ago as an industrial-arts teacher and never left. He’s in his fifth year as principal of the 51-year-old school. “Failure Is Not an Option” is one of Cortez’s slogans, and you’ll see those five words plastered all over campus. One of the school’s goals is to increase its passing rate — defined as the number of students passing all of their classes — from 73 percent to 100 percent this school year. Several interventions are in place to help struggling students, including Read 180 for English Language Learners; an eighth-hour program for those who are failing one or more classes; study halls for all athletic teams; and a Why Try program for at-risk students that incorporates peer mentoring. The school tries to keep students locked in on learning by eliminating distractions. Personal electronic devices (cell phones, iPods, iPads, etc.) are banned on campus, and a fairly restrictive dress code allows no writing on shirts other than the Cortez name or logo. P.E. shorts are out, and so are sweat suits. 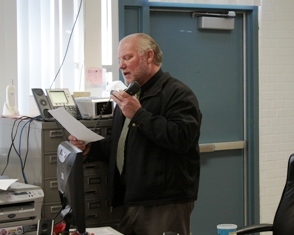 Chitwood provided morning announcements from a Cortez High science classroom. Chitwood enjoys an easy rapport with students and gets on the P.A. for midweek announcements that reinforce goal-setting. It’s difficult when about one-fourth of the school’s enrollment of 1,200 will move in and out in a year’s time. But he isn’t one to use that — or anything else — as an excuse. “Maybe the clientele has changed some since I’ve been here,” he allowed, noting that Cortez has an ethnic enrollment of 70 percent, with a similar percentage qualifying for free or reduced-price lunch. Instead, he’d rather dwell on the fact that 80 percent of students are involved in school activities (“That’s where we want them to be”) and that 75 percent of seniors go on to post-secondary training or education. The school partners with West-MEC (Western Maricopa Education Center) for career and technical education, and one of the recent results of the alliance is an industrial-size kitchen that serves breakfast daily to faculty and students and opens into an adjoining classroom. Chitwood is scheduled to attend seven Beat the Odds meetings this school year. “I didn’t know much about it, but it’s informative and it gives me a different look at things,” he said, crediting Glendale Union Superintendent Dr. Jennifer Johnson for supporting the continuing education of school administrators. The group representing GCU on Wednesday’s tour of Cortez included Dr. Tacy Ashby, vice president for strategic educational alliances, and Dr. Carlyn Ludlow, assistant dean of the College of Education.